When it comes to life, I am the most forgetful person! I forget eeeeeverything. I write things down and forget to look at what I wrote. I’ve tried sooooo many different calendars and diaries, but nothing worked for me. After forgetting (for the fourth time!) that I was supposed to be presenting at the staff meeting, I decided that I needed to be more proactive about this problem. 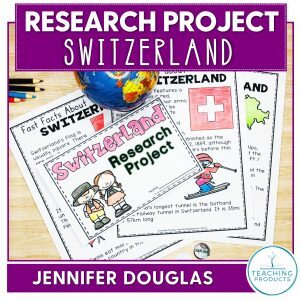 That’s when I created my own Teacher Planner (keep reading, I have a FREE copy to give to you at the end of this post!). You see, for me, planners always have all those extra pages that I just never use. The page for notes? Not for me. The page for student contact details? Nope, our amazing admin team just print off a new one whenever the details change. I don’t know a single teacher who has time to be updating their handwritten details every time a student moves house! Anyway, the Teacher Planner that I created was made specifically for me. Then I added a few extra pages that I know other teachers might like (remember that student contact details page I didn’t like?? That’s in there!). And, because I’m an old-school pen and paper kind of gal, this planner is totally printable. I only print the pages that I use, and then I place it all into a binder to keep it together. Easy peasy, instant Teacher Binder. So what did I include in my 58-page ultimate-absolutely-perfect-for-me-binder? 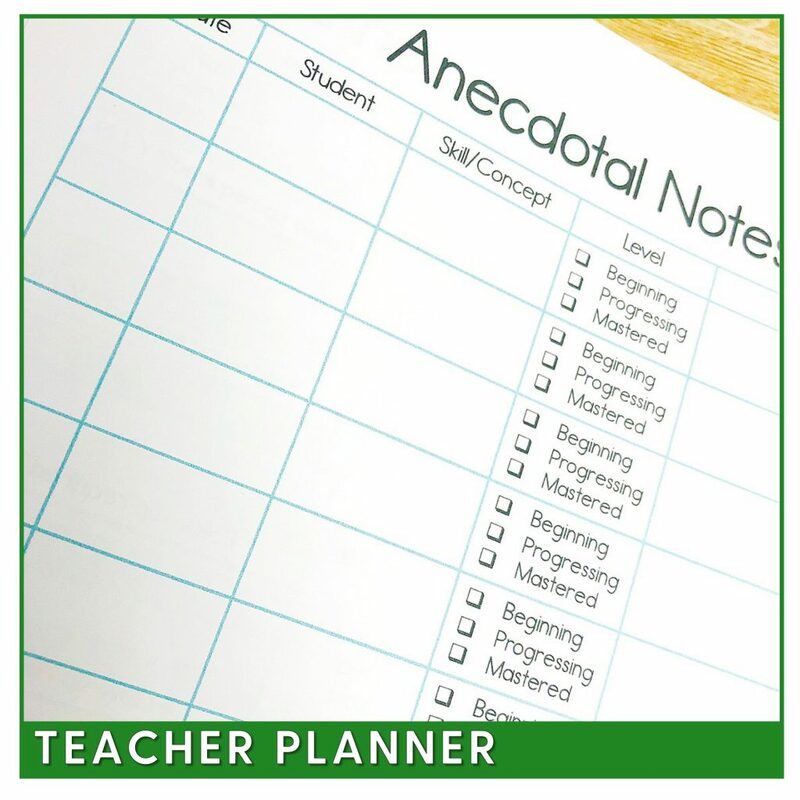 Still not convinced this Teacher Planner will work for you? That’s totally fine! Remember how many different planners I tried before this one?! Keep reading to see how I actually use this planner to PLAN my lessons (and keep structure to my life!). I use this double-page spread to record significant dates. I also use this to plan out the curriculum across the year. I’ll pencil in when I need to be teaching fractions, number sense, measurement, and everything else that teachers teach. And I do use pencil for this, because I know it will change throughout the year. This is where I focus my yearly overview. So, if I’m teaching measurement for two weeks in May, I’ll break that concept down even further and identify what I’m teaching on each day. For example, during the first week I’ll focus on informal measurement, and in the second week I’ll focus on formal measurement. Then, on each day, I’ll jot down some key points that I need to cover. I use this one a little differently. This is my reminders for the week. This is where I note any extra things that I need to be doing for each lesson – chase up books to support the lesson, make copies of pages for students, find those lost dice, etc. You might choose to use this section for your lesson planning too, that’s totally up to you. I prefer to use the Daily Planner because I can fit more detail into it. But, if you’re happy to ‘wing it’ a bit more than me, feel free to use this section for your planning! I’m gonna confess, I don’t often remember to use this one! When I do remember, I record my review of the lesson – what worked, what didn’t, what do I need to change for next time, etc. This is a great page, and I use it so much with my planning. At the beginning of each month, I make a note of which curriculum areas I need to teach. I actually write the curriculum codes onto this page. Then I can fill in the dates and tick the box to show that I have introduced, reviewed, and assessed each one. There’s also room for notes at the bottom where I make note of any students who were absent that day and need a catch up lesson! I record pre- and post- assessment data here. Add your students names to the list and you’re ready to go! I use this to keep track of EVERYTHING! Homework, permission forms, assessments, and so on. Anything whole class that requires me to be aware of individual students is recorded here. I personally don’t use this page but I’ve included it just in case you want it! Jot down all of the important contact details for your students so that you can quickly contact anyone you need to. This is a must-have page for anyone as forgetful as me! I record all communication I have with specific parents. It also helps me to remember who I need to follow up, and why. For when you’re roaming the classroom offering support, you can also be observing and assessing using this page! 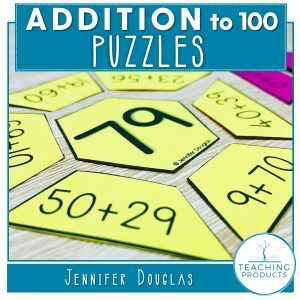 I use these pages to keep track of all of the different groups – who is in them, what they’re working on, what the next step in their learning is, etc. This is handy to record your class schedule, the things that don’t change from week to week. Not sure where your students are going once that final bell rings? Record it all on this page! There’s room to record how your students come to school, and how they go home. Simply write each name in the box next to the relevant mode of transport. So this one is pretty self-explanatory, right?! Use it to record the dates of everyone’s birthday. One page for you, and one for your students! Keep track of everyone’s log in details – no more “I can’t remember my password”. I’m not sure about you, but I have to provide proof of my professional development. I am so incredibly blessed to have an abundance of parent helpers, all ready and willing to support our learning program. I keep track of them all, and their general availability, on this form. This Teacher Planner has been a total game-changer for me, I feel so much more organized with my planning, and I’m not forgetting those important jobs. Now I’m out of excuses for this gulp presentation at the staff meeting! 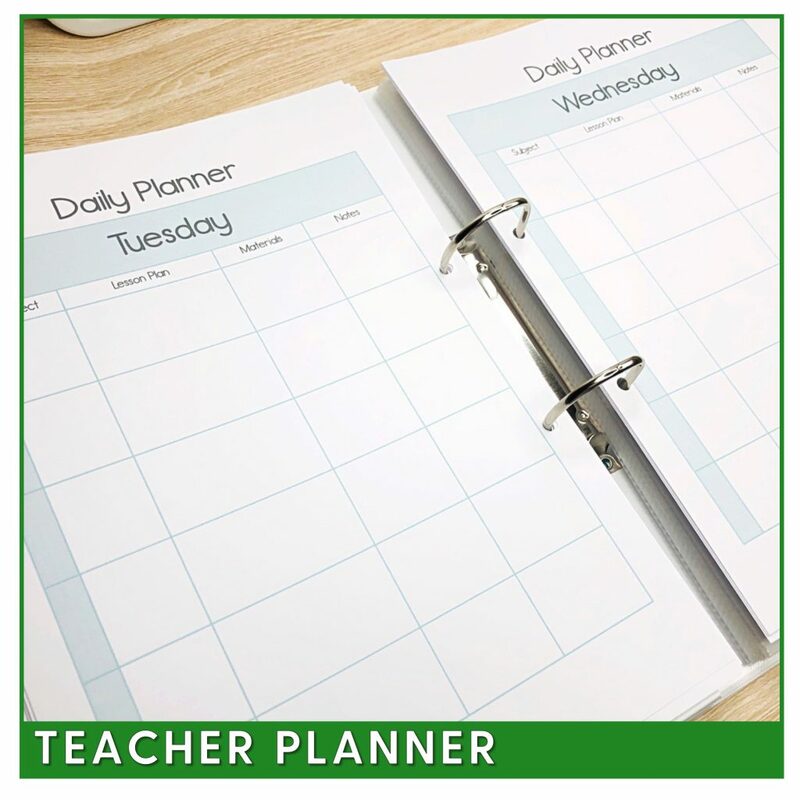 Once you’ve downloaded your FREE copy of this Teacher Planner, simply print it double sided, hole punch down the side, and pop the pages into a folder. 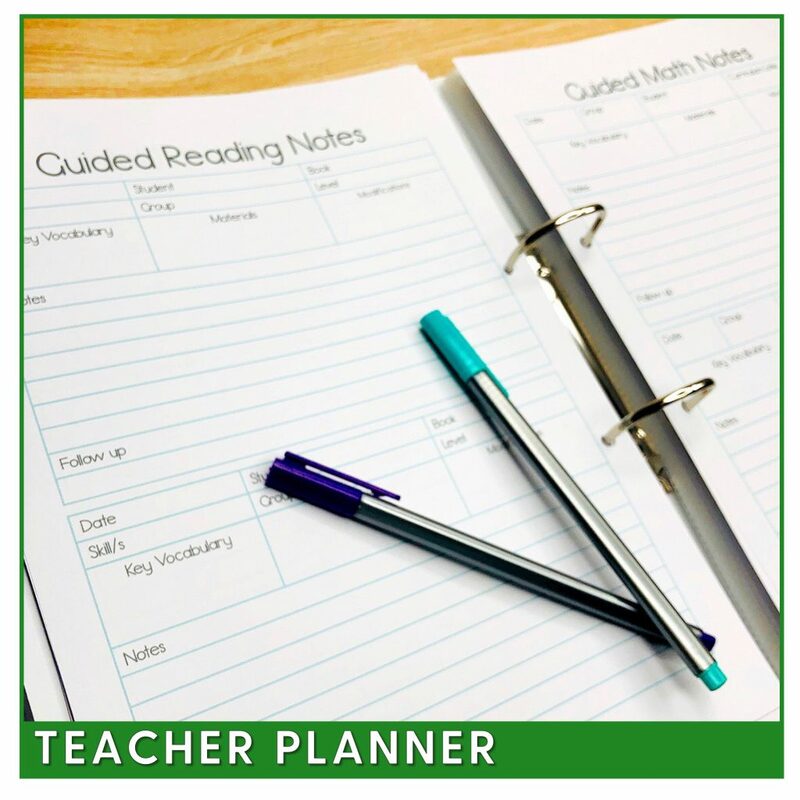 Is there anything you’d like to see added to this amazing Teacher Planner? Drop a comment below to let me know! This sounds like such a wonderful planner! I wish something like this had been around when I taught. There are so many things to keep track of as a teacher. Your planner sounds like it covers them all .. I love the idea of a curriculum tracker! And having all of this in a single binder is a great idea! Thank you for making this. It really sounds like you cover everything you might need. I know how difficult it can be to find that ONE planner that does what you need it to without leaving you with tons of unused pages. This is a fantastic idea to let everyone use only what is useful to them while giving options! I love this! If only I had had the time to make something as comprehensive as this when I was teaching. Awesome resource!! I know what you mean about planners and pages I do not need or want. I too am a pencil or pen/paper person. I love being able to customize the planners I use. Thanks for sharing. What a great planner. Thanks for sharing. I always feel when I get a planner it has pages I do not want or need, but then does not have pages I do want. Being able to print out only what I need or want would be fantastic. What a comprehensive planner! I never found one that had everything I needed either. Way to take the initiative to make your own!